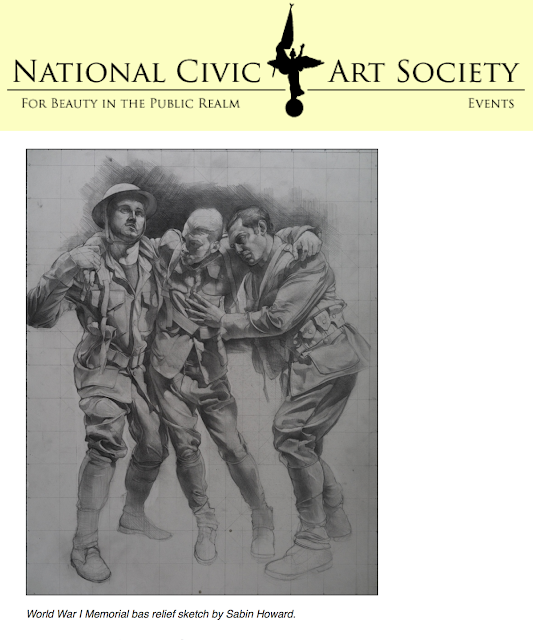 The National Civic Art Society is delighted to report that the winning design in the competition for the National World War I Memorial is a victory for classical commemorative art! The dominant feature of the design consists in traditional figurative sculptures by the talented New York-based artist Sabin Howard. The memorial plan, co-designed by architect Joseph Weishaar, contains large-scale bronze bas reliefs as well as a central sculpture of three soldiers firing a cannon. The memorial will be located in Pershing Park on Pennsylvania Avenue in Washington, D.C. This victory comes after NCAS promoted classical entries in an article forForbes as well as at a panel discussion we hosted at the Army and Navy Club in D.C. Among the speakers at that event was the vice chairman of the World War I Centennial Commission, the body overseeing the creation of the memorial. He was a non-voting member of the competition jury. NCAS can take special pride in this win for classical art: As the Huffington Post reported, Sabin Howard entered the competition at NCAS’s encouragement.